In December 2009, I drove south on U.S. Highway 101, known in far Northern California as The Redwood Highway. 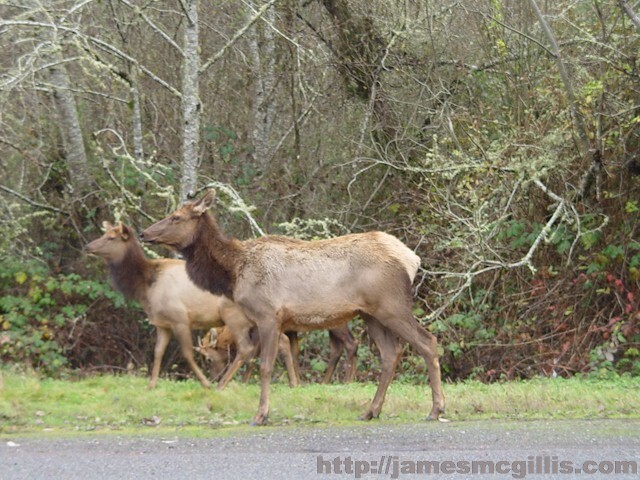 Near Davison Road, in a spot called Berry Glenn, I encountered a herd of Roosevelt Elk. About twenty-in number, they were migrating north along the far edge of the highway. Since we were within Prairie Creek Redwoods State Park and only a mile from Redwood National Park, I sensed that these animals had never heard the sound of a hunter’s rifle. Long before native Yurok Indians made their way along Redwood Creek, the distant ancestors of these animals had walked this path. 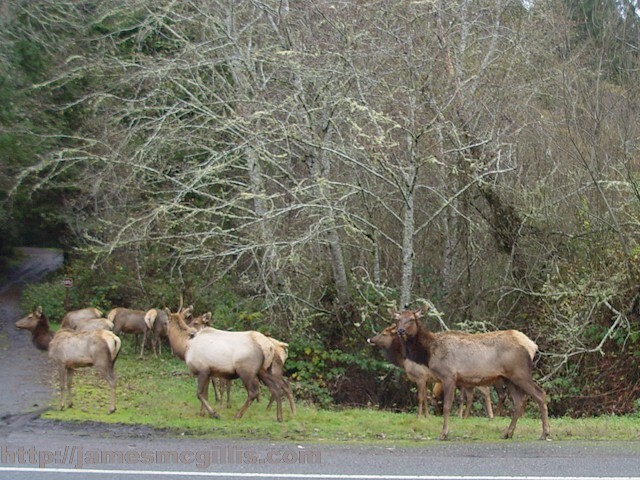 Since Roosevelt Elk are among the largest of the deer family, I stayed inside my vehicle, turned on my emergency flashers and then paused to take a few pictures. By the time I had pulled off the road and stopped, the bull who led this harem was hidden from sight. The visible herd included only females and juveniles. Where might the bull linger? Was he hidden in the brush along the highway? With a light drizzle falling, the females, walking in pairs, passed my open window. Although the elusive males can weigh up to half a ton, adult females easily top 600 pounds. Although traffic was light that weekday afternoon, one driver came to a halt behind me, leapt out of his car and approached the herd while standing in front of my vehicle. It was then that I realized that a fight was brewing. A lone female, haggard by age and weather, protected the rear of the heard. By her actions, it was clear to me that she wanted no part of this human interloper. In defiance, she planted all four hooves in the center of the northbound lane and bellowed repeated warnings at the photographer. Whether one is viewing whales in the ocean or elk herds by the road, the first rule of wildlife viewing is, “Do not approach wild animals”. According to Banff National Park, Alberta, Canada, far more humans are injured there by elk than by bears. When I realized that this crazed looking cow was bellowing at the man, I called to him and said, “That animal is upset. She could charge you at any time. You’d better get away from there.” Although he never looked at me or acknowledged my presence, he did move back behind my vehicle and then returned to his car. As I departed the scene, I kept my emergency flashers on as a warning signal to approaching motorists. Only when I was far from the action did I breathe a sigh of relief. As I continued my drive, I recalled a time in Yellowstone National Park when I took a risk in order to photograph an American Bison. Parking my car near a spring fed meadow; I spied a lone male bison grazing perhaps fifty feet away. Wanting to get the best picture possible, I walked closer to the beast. As seen in the accompanying photo, he was an adult male, in the prime of his life. Standing there, peacefully grazing in that meadow, he was by far the largest animal I had ever seen up close in nature. The word, "formidable" came to mind. If you break that word down, you get "form", "id" and "able". Certainly, that bison was an architype representing all three concepts. Almost imperceptibly, I saw the bison turn his head tward me. Even as a low grunt emanated from his throat, I edged closer. After taking my picture, I backed away slowly. At what still felt like an unsafe distance, I turned and walked more quickly towards my car. It was then, with my back turned toward the bison that my mind's eye opened, if only to see him charging at me. If this were true, it would be a close race to my car. With a full ton of angry muscle and bone hurtling toward me, I could easily lose my concentration and composure. Short of breath when I reached my car, I turned to look back at the bison. 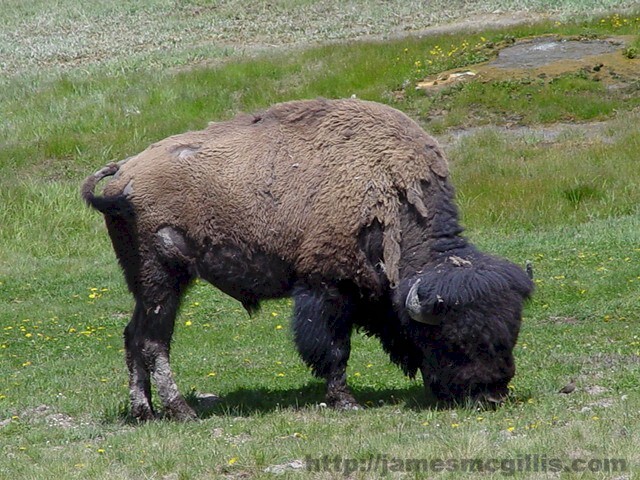 Still pulling up clumps of fresh grass to eat, the bison had not moved. At first, thinking that he was a dumb animal, I had trespassed across an unseen boundary that demarcated his territory. That summer afternoon, I had intruded into his peaceful energy field. Humans and bison have had a continual, if distant relationship with each other in Yellowstone for almost two hundred years. In that time, I believe that the bison have found collective wisdom. As almost two centuries have passed, the Yellowstone bison herds have genetically self-selected their gene pool in favor of those who are indifferent to humans, no matter how provocative or foolish those humans may be. In the future, we see a time when humans shall remain calm and respectful while in the presence of nature. 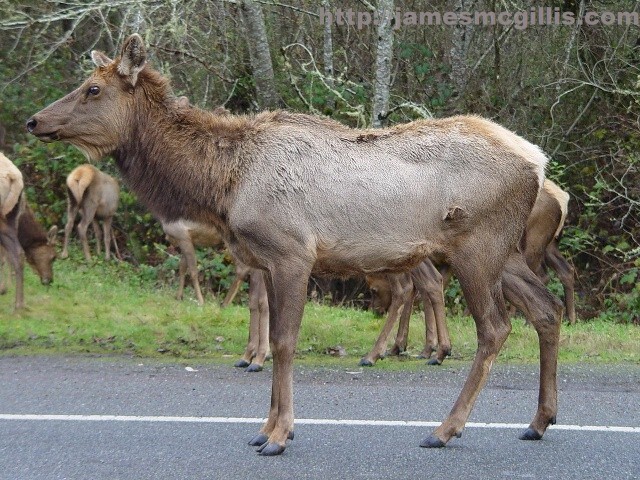 If so, that elusive bull elk may elect to stand calmly in the brush, rather than crashing out on to The Redwood Highway and into the path of an oncoming automobile. In honor of humanity's future relationship with nature, we believe that soon it shall be so.